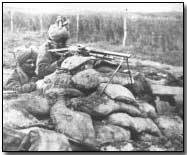 The first action we fought at Jebel Hamrin, in the third week of March, 1917, was a sanguinary affair. The Turks held us back on the hills when they were crossing the Diala with the Russians behind them, and, as we imagined, pressing them hard. The Turkish gunners had the range of us, and we learnt the difference between the burst of a shell on hard rock and soft soil. Also the warren of low hillocks was so complicated that one never knew if one were on dead ground or not. In places where one thought one was under cover one drew machine-gun fire, and most of the little passes between one low ridge and another were traps. I remember a patch of open ground between rock which a sniper had marked for his preserve. There was a bush of some blue leguminous plant just where one reached cover the other side, and the impulse to recross was irresistible. The relief to be out of the flat was so great that the actual hills and the birds and the flowers and the gravel and rock interested me more at the time than the business that had brought us there. These were no doubt the preoccupations of a trivial mind, but one consoled oneself with the thought that the covetousness and intrigues, or the honest instinct for survival, which had sent armed bodies of men through these passes for the last two thousand years were merely transient, whereas the hills in their stark nakedness or dainty covering were eternal. I have no doubt there were renegades in the armies of the Chosroes who botanised in a battle. Nobody bothers much now which side did the most killing, but the iris and the mauve hyacinth and the red anemone still blossom under Jebel Hamrin. Keary's consequent preparations to storm the Turkish lines were not undertaken in secrecy, with the result that when the British attack finally began on 25 March (having first laboriously navigated both canals) they found the Turkish defence well prepared. The attack a failure, some 1,200 British casualties were suffered while Ishan's force managed to escape southwest, headed for Turkish forces sited on the River Tigris.